There are so many reasons to visit Yorkshire (though we may be somewhat biased...), and Yorkshire Sculpture Park is definitely one of them. Situated close to Wakefield and Leeds, in a rural location where rolling farm fields offer a beautiful backdrop to the park's artwork. Indeed, 'art without walls' is the park's mantra; visit Yorkshire Sculpture Park for the unique experience of visiting an art gallery out in the open air. Yorkshire Sculpture Park always features around eighty open air installations and sculptures; gifted or commissioned by artists from all over the world. The current exhibition displays work from renowned Chinese contemporary artist, Ai Weiwei; British sculptor and environmentalist, Andy Goldworthy; beautiful woodwork by David Nash; and a series of iron figures by Elisabeth Frink, among many other artists. Find out more about the current open air exhibitions here. After wandering around the grounds and admiring the sculptures, we ventured over to the woodland area where we enjoyed a lovely, secluded walk in and amongst an array of flora and wildlife. Heading on the Upper Path, the walk takes you through the woods, past the Greek Temple, and around the banks of Upper Lake. Continue all the way along the banks of Lower Lake before crossing the bridge at the dam and heading back into Country Park. Interspersed with various hidden sculptures, this is a great way to see art while being immersed in nature - what Yorkshire Sculpture Park is all about. We'd also highly recommend the cafe for great quality, fresh and seasonal food, well-priced and with a lovely view from the balcony. Find a map of the park here. 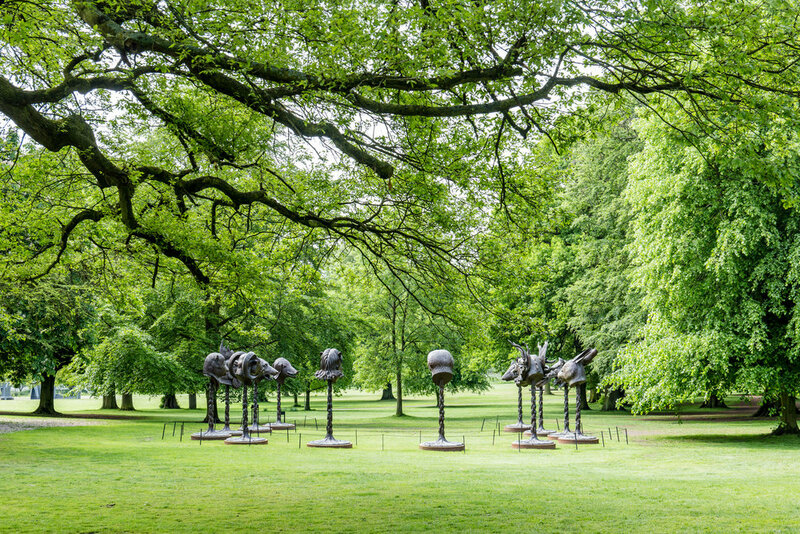 Until April 2019, Italian artist Giuseppe Penone is showcasing an exhibition at Yorkshire Sculpture Park dedicated to the tree as an art form. The exhibition is located in the Underground Gallery and across the grounds, with a body of work spanning five decades that explores man's intimate relationship with nature. "His poetic practice addresses themes around the body, nature, time, touch and memory, played out across different materials from stone, acacia thorns and graphite, to thousands of laurel leaves." (taken from the YSP website). We absolutely loved this exhibition, admiring twenty ton blocks suspended between branches, a tree with it's tip painted gold, and a mould of Penone's own hand gripping a narrow trunk. Each work explores a unique concept and invites you to question our relationship with trees and nature as a whole. Yorkshire Sculpture Park is the ideal place to spend a day outside, enjoying world-renowned art and breathtaking nature side by side; a unique and special experience in the heart of Yorkshire.